The white throat bordered by a narrow black collar, ( The black-and-white feathers are less than 12 x 5 mm in size. In common with most other grassland partridge, the wings appear rufous or red in flight. Predominantly a grassland species. Orange River Partridge occur in the drier savannas and grasslands of the western regions of southern Africa. They prefer perennial grass of medium height and density, avoiding areas of sparse cover such as overgrazed, frequently burnt areas, areas with too dense a growth of weeds or where grass has become too tall and rank. They are seldom found in the middle of homogeneous grasslands or croplands and almost never among trees. Orange River Partridge appear to prefer the boarders of pans, edges of croplands and mountain slopes with patches of moderately dense cover. Their optimum habitat is often characterised by termite mounds. They are apparently less dependent on underground bulbs than other grassland partridge species. This is a walk up shoot over pointing dogs in the Freestate province. English Pointers and German Shorthairs are used to hunt, point and retrieve the birds. Orange River Partridge are found in covies of between five and eight birds, sit tight for pointers and flush in singles, pairs, or at once. The hunt takes place in the roaming grasslands of South Africa’s central plateau. An average level of fitness is an advantage. It is extremely rewarding to the enthusiastic wingshooter. You will experience classic shooting to bag one of the prettiest upland gamebirds in in South Africa. 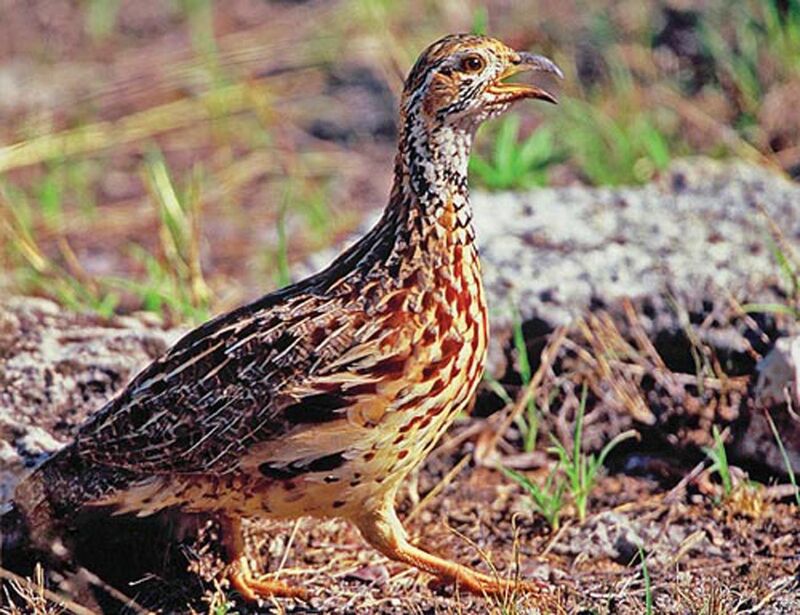 Guns can expect to bag Guineafowl, Swainson’s & Natal Francolin on the same shoot. Karoo Wingshooting has Orange River Partridge concessions in excess of 15,000 hectares (37,000 acres).